Feral horses have severely damaged the landscape in Kosciuszko National Park. The future management of New South Wales’s national parks is one of the issues on the line in Saturday’s state election. Other states will be watching the outcome closely. Depending on who wins, the outcome for Kosciuszko National Park spans from restoration and recovery to ongoing environmental decay, with feral horses given priority over native species. aerial culling is humane, effective, and cheaper than other methods. But despite the clarity of recommendations emerging from research, political parties have taken a broad range of approaches. A feral horse exclusion fence. But which side of the fence are the major parties on? The Liberal/National coalition has pledged to enact its Kosciuszko Wild Horse Heritage Bill, which was passed by the state parliament last year and aims to “recognise the heritage value of sustainable wild horse populations within parts of Kosciuszko National Park”. This legislation would ensure several thousand feral horses remain in the park, potentially compromising the conservation goals of the park’s management plan. This month, Deputy Premier John Barilaro said the government would “immediately” reduce horse numbers by 50%, through trapping, rehoming, fertility control, and relocating horses to “less sensitive” areas. Although he appeared to endorse an ultimate population target of 600 feral horses in front of an audience that was receptive to that idea, under pressure from the pro-brumby lobby, he later clarified that the coalition would aim to keep 3,000-4,000 feral horses in Kosciuszko. Labor, along with the Greens and the Shooters, Fishers and Farmers party, has pledged to repeal the Kosciuszko Wild Horse Heritage Bill if it wins the election, and has committed A$24 million to restore the national park. Its six-point national parks restoration plan bans aerial culling, instead proposing to control horses using rehoming, while expanding research on fertility control. Labor’s plan also mentions active management of feral horses in sensitive ecosystems, and ensuring large horse populations do not starve to death. It plans to achieve these two goals by trapping and rehoming brumbies. Labor also plans to keep a “smaller population” of feral horses in areas within the national park “where degradation is less critical”. The NSW Greens has arguably the most evidence-based policy, aiming to reduce horse numbers by 90% in three years, with a longer-term goal of full eradication. This means national parks would be managed for native Australian species. That is important in NSW, where only 10% of the state has been allocated to protected areas, well below international standards of 17%. They would achieve this reduction using all humane methods currently available, including trapping, rehoming, mustering, and ground-based and aerial shooting. The Greens would also fund rehabilitation of damaged habitat, and has flagged substantial funding for conservation initiatives. The Shooters, Fishers and Farmers party supports immediate action to reduce feral horse numbers using humane methods, including ground shooting, but not aerial culling. The party, which holds one lower house seat and has two upper house members, has announced no plans for restoration of the national park. The Animal Justice Party, which has just one upper house member in the parliament, has endorsed “non-lethal control measures” in areas that are clearly being degraded by feral horses. It says this should be achieved entirely using fertility control and relocation. The party has also described brumby culling proposals as “horrific” and called for urgent national legislation to protect them. There is pressure from pro-brumby lobbyists to keep feral horse populations in Guy Fawkes, Barrington Tops, Oxley Wild Rivers, the Blue Mountains, and other NSW national parks. In Victoria, a pro-brumby pressure group will take Parks Victoria to the Federal court later this year to prevent removal of a small but damaging horse population on the Bogong High Plains in the Alpine National Park. When NSW voters decide the fate of Kosciuszko National Park on Saturday, their verdict could have broader ramifications for protected areas throughout Australia. Many Australians will take a trip to one of our national parks over the holidays. In New South Wales alone, there are more than 51 million visits to national parks each year. Few if any of us would expect not to make it out of one alive. But national parks claim lives around the world every year. In the United States, an average of 160 visitors each year die in a national park. Australia’s numbers are unsurprisingly smaller – there have been 13 deaths in national parks since 2013 – but the common theme is that these fatalities are usually avoidable. Wherever death and injury are avoidable, it pays to alert people to the dangers. In Australia the main risks – falling off cliffs and waterfalls, deadly snakebites, getting lost – can all be reduced by one crucial piece of advice: stick to the path. It sounds simple enough. But in fact, visitors failing to heed advice about walking trails is a significant problem for national park managers. Venturing off-trail poses significant danger to visitors, and puts unnecessary strain on emergency services and police. Our 2017 study was the first to gather some hard numbers on the reasons why people tend to disobey the signs. We surveyed 325 visitors at Blue Mountains National Park on their attitudes to off-trail walking. So, what’s behind our compulsion to get off the beaten track? First, 30% of respondents told us that off-trail walking can result in a shorter or easier walking route, whereas 20% said straying from the path can afford a closer look at nature. Second, visitors are heavily influenced by other visitors and friends – the “monkey see, monkey do” effect. They are much more likely to leave the track if they see someone else do it first. It might make for a great photo, but the dangers are obvious. Third, in the absence of a handy toilet, many visitors venture off-trail for a private “comfort break”. Finally, visitors rely heavily on signage to help them stay on the designated trail. Some 13% of our survey respondents said they would venture off-trail if there was a lack of adequate signs. What might change our behaviour? There are several tactics park authorities can use to reduce off-trail walking at national parks. They can use direct management techniques such as capping site capacity to avoid congestion – basically, regulating the maximum number of walkers in a given area, so the paths don’t feel too congested. They may consider zoning orders to permit or limit certain events to control capacity. Ropes or low barriers along the walking trail can give a clear indication of the trail’s boundary. Of course, there is a fine balance between building structural barriers and maintaining the feeling of natural wilderness in a park. Social media marketing might also work well. Suggested slogans such as “A true mate sticks to the trail” or “Be safe and stay on the trail with your mates” might help influence visitors’ behaviour. Park visitors are ever more connected to social media – Parks Australia’s social media channels reach an estimated 30 million people. Signs should also let walkers know exactly what they are getting themselves into, by posting clearly the length and typical duration of walking tracks, and the distance to popular destinations such as lookout points. These signs should be posted both at the beginning of trails at at intervals along it, particularly at junctions or river crossings. When it comes to our national parks it’s best to assume that, as with most things in life, humans will look for alternatives to what is expected. It’s human nature to want to bend the rules in what we might wrongly think is a harmless way. Bushwalking in a national park is a great way to spend some time this summer. But when going off-trail could turn a tranquil walk into a deadly accident, it pays to stay on the beaten track. Trees have died in Rocky Mountain National Park, Colo., as climate change has intensified bark beetle infestations and drought. Human-caused climate change is disrupting ecosystems and people’s lives around the world. It is melting glaciers, increasing wildfires, and shifting vegetation across vast landscapes. These impacts have reached national parks around the world and in the United States. Until now, however, no analysis had examined climate change trends across all 417 U.S. national parks. The United States established the first national park in the world, Yellowstone National Park, in 1872. U.S. national parks today protect some of the most irreplaceable natural areas and cultural sites in the world. Colleagues and I aimed to uncover the magnitude of human-caused climate change on these special places. We conducted the first spatial analysis of historical and projected temperature and precipitation trends across all U.S. national parks and compared them with national trends. Our newly published results reveal that climate change has exposed the national parks to conditions hotter and drier than the country as a whole. This occurs because extensive parts of the parks are in extreme environments – the Arctic, high mountains, and the arid southwestern United States. Many national parks are located in regions with the fastest rates of warming in the United States. National parks conserve the most intact natural places in the country. They harbor endangered plants and animals and unique ecosystems. They also help assure human well-being by protecting watersheds that provide drinking water to people and by storing carbon, which naturally reduces climate change. Our findings show that temperatures in the national park area increased at double the national rate from 1895 to 2010. At the same time, precipitation decreased across a greater fraction of the national park area than across the United States as a whole. Our analysis of climate trends starting in 1895 showed that temperatures increased most in Denali National Preserve, Alaska, and rainfall declined most in Honouliuli National Monument, Hawaii. Hotter temperatures from human-caused climate change have intensified droughts caused by low precipitation in California and the southwestern United States. Many national parks in the southwestern U.S. have experienced intense drought. Human-caused climate change has caused historical impacts in places where we found significant past temperature increases. These impacts include melting of glaciers in Glacier Bay National Park, Alaska, tree death from bark beetles in Yellowstone National Park, upslope vegetation shifts in Yosemite National Park, California, and northward vegetation shifts in Noatak National Preserve, Alaska. To quantify potential future changes, we analyzed all available climate model projections from the Intergovernmental Panel on Climate Change. Continued greenhouse gas emissions under the highest emissions scenario could increase U.S. temperatures in the 21st century six times faster than occurred in the 20th century. This could increase temperatures in national parks up to 9 degrees Celsius by 2100, with the most extreme increases in Alaska, and reduce precipitation by as much as 28 percent, in the national parks of the U.S. Virgin Islands. Heating could outpace the ability of many plant and animal species to move and stay in suitable climate spaces. In places where models project high temperature increases, research has found high vulnerabilities of ecosystems. These vulnerabilities include severely increased wildfire in Yellowstone National Park, extensive death of Joshua trees in Joshua Tree National Park, California, and possible disappearance of American pika, a small alpine mammal, from Lassen Volcanic National Park, California. Human-caused climate change has doubled wildfire in the western U.S. Here, the Rim Fire burns west of Yosemite National Park, Calif., in 2013. Our research provides climate data to analyze vulnerabilities of plants, animals and ecosystems. The data can also help park managers develop adaptation measures for fire management, invasive species control and other ways to protect parks in the future. For example, based on analyses of the vulnerability of ecosystems to increased wildfire under climate change, parks can target prescribed burning and wildland fire in the short term to reduce the unnatural buildup of fuels that can cause catastrophic wildfires in the long term. A solar panel on the roof of a building in Lassen Volcanic National Park, Calif., reduces greenhouse gas emissions and electricity costs for the park. Ultimately, our results indicate that reducing greenhouse gas emissions from cars, power plants and other human sources can save parks from the most extreme heat. Compared to the highest emissions scenario, reduced emissions would lower the rate of temperature increase in the national parks by one-half to two-thirds by 2100. Cutting greenhouse gas emissions through energy conservation, improved efficiency, renewable energy, public transit and other actions would reduce the magnitude of human-caused climate change, helping save the U.S. national parks for future generations. Young men and overseas tourists are particularly at risk. Every time we hear of the tragic death of a visitor in one of Australia’s spectacular national parks, there is cause for reflection on how we communicate safety messages in nature. Our study, published in the Journal of Outdoor Recreation and Tourism, reviewed some of the signs in national parks in Queensland and Victoria; we also interviewed rangers and park managers. Outdoor recreation inherently comes with risk but there are ways to reduce it without wrapping people up in cotton wool. One of the simplest ways is to critically examine the way we design safety signs to ensure that visitors actually read them, connect with the message, and accept that this warning does really apply to them. Our findings help to show why and how particular signs are effective at communicating safety messages – and what not to do. avoid crowding too many messages into one spot. Millions of visitors access and enjoy Australia’s vast network of protected areas safely every year. Park managers want locals and tourists to visit natural areas – it is good for health and well-being, the economy and society. Visitors to parks are also more likely to support national parks. Effective communication of safety information for visitors to national parks is essential, particularly where the potential consequences of mishaps are severe. Visitor ignoring warning sign to ‘get a better shot’. We know from previous research that certain groups, such as young men and international tourists, are particularly at risk – too often with tragic and sometimes expensive consequences. Some park agencies are actively targeting high-risk groups at specific sites, as this example shows. A signed aimed at high-risk visitor group (18-30 year old males) and complementing traditional approaches to safety signage. The focus is to tell the story of past tragedies to get across the message that the risk is real and relevant to them. Of course, risk is part of the attraction for some park-goers. But every visitor needs to know what is appropriate and inappropriate behaviour, and how to take responsibility for their own safety. Thinking carefully about how we design signs to get safety messages across effectively is an important part of managing risk in national parks and natural areas generally. Based on our analysis of research findings both within and outside park settings, we developed checklists to help park managers assess how effectively their signs communicate risk to national park visitors. We tested these “best practice principles” checklists at several sites with two Australian national parks agencies. The process proved valuable in strengthening current safety sign policy and practice. For example, the following sign meets the criteria for being “noticeable” and “easy to comprehend”. This is an exemplary sign. Park authorities often need to communicate a lot of information at once to park goers. However, this can be done by using clever graphics and limiting the number of messages per sign. It’s also important to put warning signs close to the risky site, not simply warning people when they enter the park. The example below shows how having multiple signs grouped together can make it hard for users to get the key messages, even if they are driving at low speed. It is all too easy to drive past and ignore the signs altogether. Our study also highlights that good safety signs can support and complement the dedication and personal responsibility of frontline park staff. Serious incidents can have a direct effect on staff personally, and on the reputation of certain sites, particularly in the eyes of local emergency service workers. Safety signage will be more effective if embedded in a coordinated risk-management system. Activities in nature will always carry some risks and some people will choose to engage in unsafe activities despite knowing better. Accidents will continue to occur. That said, our best practice principles for signage help park managers to do the best they can to make visitors fully aware of the risks while preserving the integrity of the natural site. They also have direct applications to other nature-based visitor sites. Signs can help address issues such as the recent incidents with kangaroos at Morisset Hospital near Sydney, where visitors were feeding the animals carrots to get a close-up picture. We have a poor understanding of what makes different types of people (such as those with different cultural backgrounds and experience levels, or people responding to peer pressure) misunderstand or ignore safety warnings. Best practice signage is already in place at many high-risk park sites. As park visitation continues to increase and visitor profiles change, we need more research on what can help persuade at-risk visitors to read and act on safety messages. It is time to invest in targeted research on this issue, including trialling and evaluating more innovative and persuasive communication techniques. This article and research was co-authored by Rob Saunders, an independent consultant focused on park and recreation strategy, planning and effective communication. The Trump administration will review the status of The Bears Ears National Monument in Utah, one of the country’s most significant cultural sites. In the few days since President Trump issued his Executive Order on National Monuments, many legal scholars have questioned the legality of his actions under the Antiquities Act. Indeed, if the president attempts to revoke or downsize a monument designation, such actions would be on shaky, if any, legal ground. But beyond President Trump’s dubious reading of the Antiquities Act, his threats also implicate a suite of other cultural and ecological laws implemented within our national monuments. The U.S. Supreme Court upheld the validity of larger-scale monuments when it affirmed President Teddy Roosevelt’s 1908 designation of the Grand Canyon as “the greatest eroded canyon in the United States” in Cameron v. U.S. in 1920. Cameron, an Arizona prospector-politician, had filed thousands of baseless mining claims within the canyon and on its rim, including the scenic Bright Angel Trail, where he erected a gate and exacted an entrance fee. He challenged Roosevelt’s sweeping designation and lost, spectacularly, because the Grand Canyon’s grandeur was precisely what made it worthy of protection. The Antiquities Act has long been used to protect important archaeological resources. Some of the earliest designations, like El Morro and Chaco Canyon in New Mexico, protected prehistoric rock art and ruins as part of the nation’s scientific record. This protection has been particularly critical in the Southwest, where looting and pot hunting remain a significant threat. Similar interests drove the creation of several monuments subject to Trump’s order, including Grand Staircase-Escalante National Monument, Canyon of the Ancients National Monument and Bears Ears National Monument. Thus, any changes to those monuments mean less protection for – and less opportunity to learn from – these archaeological wonders. While other recent designations recognized the present-day use of monument areas by tribes and their members, Bears Ears National Monument was the first to specifically protect both historic and prehistoric cultural resources and the ongoing cultural value of the area to present-day tribes. Unlike prior monuments, Bears Ears came at the initiative of tribal people, led by a unique inter-tribal coalition that brought together many area residents and garnered support from over 30 tribes nationwide. This coalition also sought collaborative tribal-federal management as a way to meaningfully invigorate cultural protection. As a result, President Obama also established the Bears Ears Commission, an advisory group of elected tribal members with whom federal managers must meaningfully engage in managing the monument. For example, Devils Hole National Monument provides the only known habitat for the endangered Devils Hole Pupfish (Cyprinodon diabolis). This has meant that groundwater exploitation from nearby development is restricted to protect Pupfish habitat. Similarly, the Grand Staircase-Escalante National Monument is home to an array of imperiled wildlife, including the endangered desert tortoise and the endangered California condor, along with many other native species like desert bighorn sheep and peregrine falcons. The Grand Staircase-Escalante National Monument is among the national monuments vital to enforcing the Endangered Species Act. Interior Secretary Ryan Zinke will need to assess the cultural and ecological value of a national monument in his home state of Montana. The monument contains a National Wild and Scenic River corridor and segments of the Lewis and Clark and Nez Perce National Historic Trails, as well as the Cow Creek Island ACEC. It is the “fertile crescent” for hundreds of iconic game species and provides essential winter range for sage grouse (carefully managed to avoid listing under the ESA) and spawning habitat for the endangered pallid sturgeon. Archaeological and historical sites also abound, including teepee rings, historic trails and lookout sites of Meriwether Lewis. 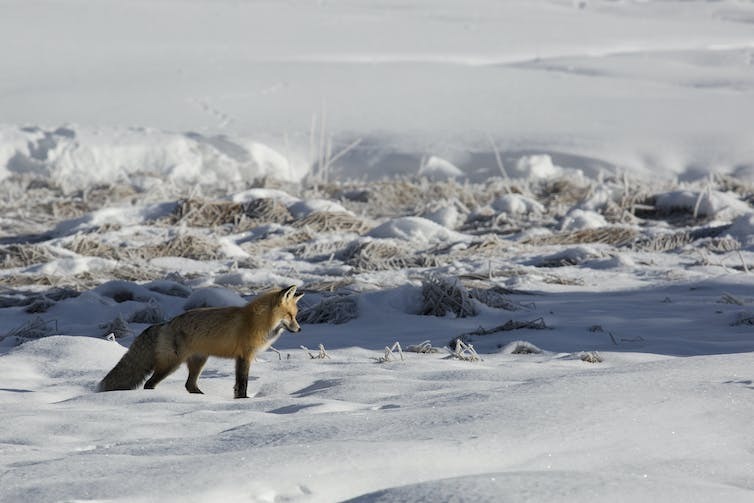 A red fox listening for prey under the snow in Yellowstone National Park. Noise can affect foxes and other animals that rely on their hearing when they hunt. As transportation networks expand and urban areas grow, noise from sources such as vehicle engines is spreading into remote places. Human-caused noise has consequences for wildlife, entire ecosystems and people. It reduces the ability to hear natural sounds, which can mean the difference between life and death for many animals, and degrade the calming effect that we feel when we spend time in wild places. Protected areas in the United States, such as national parks and wildlife refuges, provide places for respite and recreation, and are essential for natural resource conservation. To understand how noise may be affecting these places, we need to measure all sounds and determine what fraction come from human activities. In a recent study, our team used millions of hours of acoustic recordings and sophisticated models to measure human-caused noise in protected areas. 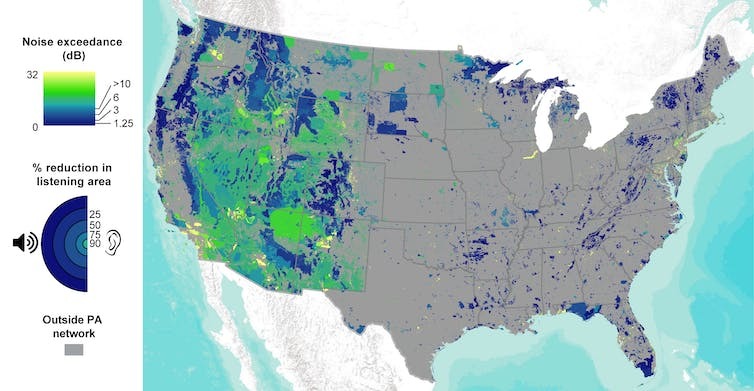 We found that noise pollution doubled sound energy in many U.S. protected areas, and that noise was encroaching into the furthest reaches of remote areas. Pine siskin song as a car passes by, Rocky Mountain National Park. Our approach can help protected area managers enhance recreation opportunities for visitors to enjoy natural sounds and protect sensitive species. These acoustic resources are important for our physical and emotional well-being, and are beautiful. Like outstanding scenery, pristine soundscapes where people can escape the clamor of everyday life deserve protection. “Noise” is an unwanted or inappropriate sound. We focused on human sources of noise in natural environments, such as sounds from aircraft, highways or industrial sources. According to the Environmental Protection Agency, noise pollution is noise that interferes with normal activities, such as sleeping and conversation, and disrupts or diminishes our quality of life. Human-caused noise in protected areas interferes with visitors’ experience and alters ecological communities. For example, noise may scare away carnivores, resulting in inflated numbers of prey species such as deer. To understand noise sources in parks and inform management, the National Park Service has been monitoring sounds at hundreds of sites for the past two decades. Noise is hard to quantify at large-landscape scales because it can’t be measured by satellite or other visual observations. Instead researchers have to collect acoustic recordings over a wide area. NPS scientists on our team used acoustic measurements taken from 492 sites around the continental United States to build a sound model that quantified the acoustic environment. National Park Service staff set up an acoustic recording station as a car passes on Going-to- the-Sun Road in Glacier National Park, Montana. They used algorithms to determine the relationship between sound measurements and dozens of geospatial features that can affect measured average sound levels. Examples include climate data, such as precipitation and wind speed; natural features, such as topography and vegetation cover; and human features, such as air traffic and proximity to roads. Using these relationships, we predicted how much human-caused noise is added to natural sound levels across the continental United States. To get an idea of the potential spatial extent of noise pollution effects, we summarized the amount of protected land experiencing human-produced noise three or 10 decibels above natural. These increments represent a doubling and a 10-fold increase, respectively, in sound energy, and a 50 to 90 percent reduction in the distance at which natural sounds can be heard. Based on a literature review, we found that these thresholds are known to impact human experience in parks and have a range of repercussions for wildlife. The good news is that in many cases, protected areas are quieter than surrounding lands. However, we found that human-caused noise doubled environmental sound in 63 percent of U.S. protected areas, and produced a tenfold or greater increase in 21 percent of protected areas. Map of projected ambient sound levels for a typical summer day across the contiguous United States, where lighter yellow indicates louder conditions and darker blue indicates quieter conditions. Noise depends on how a protected area is managed, where a site is located and what kinds of activities take place nearby. For example, we found that protected areas managed by local government had the most noise pollution, mainly because they were in or near large urban centers. The main noise sources were roads, aircraft, land-use conversion and resource extraction activities such as oil and gas production, mining and logging. We were encouraged to find that wilderness areas – places that are preserved in their natural state, without roads or other development – were the quietest protected areas, with near-natural sound levels. However, we also found that 12 percent of wilderness areas experienced noise that doubled sound energy. Wilderness areas are managed to minimize human influence, so most noise sources come from outside their borders. Finally, we found that many endangered species, particularly plants and invertebrates, experience high levels of noise pollution in their critical habitat – geographic areas that are essential for their survival. Examples include the Palos Verdes Blue butterfly, which is found only in Los Angeles County, California, and the Franciscan manzanita, a shrub that once was thought extinct, and is found only in the San Francisco Bay area. Of course plants can’t hear, but many species with which they interact are affected by noise. For example, noise changes the distribution of birds, which are important pollinators and seed dispersers. This means that noise can reduce the recruitment of seedlings. F-4 fighter jets pass through ‘Star Wars Canyon’ in Death Valley National Park, a spot popular with military pilots. Noise pollution is pervasive in many protected areas, but there are ways to reduce it. We have identified noisy areas that will quickly benefit from noise mitigation efforts, especially in habitats that support endangered species. Strategies to reduce noise include establishing quiet zones where visitors are encouraged to quietly enjoy protected area surroundings, and confining noise corridors by aligning airplane flight patterns over roads. Our work provides insights for restoring natural acoustic environments, so that visitors can still enjoy the sounds of birdsong and wind through the trees.